Steam Train Ride, Apple Cider Estates Tour &Tasting, Visit to Mars included! Today's outing allows you to enjoy the fall colours and the countryside north of Toronto in York Region & Dufferin County. We start off with a one hour train ride on an original steam train. Most likely our ride will be behind engine # 136, a Rogers 4-4-0 steam locomotive built in Paterson NJ in 1883. Wow... experience travel the way our ancestors did 131 years ago! After our train ride I'm sure we'll all be thirsty so we will get to quench our thirst at an estate cidery that makes some amazing apple cider. We will get a tour of the cidery followed by a tasting of 3 of their ciders! The cidery is famous for it's home made breads and baked goods and you will be able to purchase some after the tour. And we will finish our day with a visit to Mars. Well, OK, not actually the planet Mars, but to the Cheltenham Badlands, where erosion has created an area that closely resembles the surface of Mars! Amaze your friends with some cool photos. Adults: $85.00 per person, HST extra. Children: $75.00 per child, HST extra. Children will not be allowed to taste alcoholic ciders at the apple cidery. We leave the Toronto area at approximately 10:00 AM. Actual pickup times vary by stop and will be sent out in the final email to all registered attendees, 2 days before the trip. We return to Toronto at approximately 7:00 PM. Round trip transportation on deluxe highway motor coach included. One hour narrated steam train ride included. Apple cidery tour & tasting included. Visit to a Martian landscape aka the Cheltenham Badlands included. Complimentary water and snacks on the bus, included. All tips included. Taxes extra. There are 3 pickup locations in the Toronto area. Children 10 and older are welcome on this trip. Price is $10 less per child. Children will not be allowed to participate in the cider tasting. 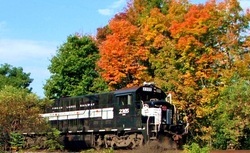 Our first stop is a one hour ride on an original steam train to see the fall colours. 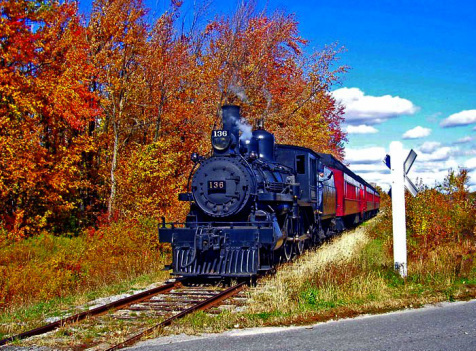 What better way to see the leaves in their blaze of orange in the countryside of Dufferin County than from a steam train to truly evoke those lovely memories of days gone by. And if you're a train buff, not only will you be able to get up close and personal with the steam engines but also feel free to bring your camera and take all the photos you wish. After our train ride, seeing as it's the fall, what could be better than to have some apple cider made at one of the premier apple cideries in Ontario. Our second stop will be the fabulous Spirit Tree Cidery. 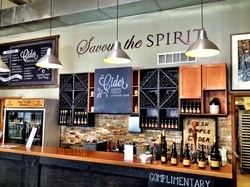 Nestled amongst the rolling Caledon hills, Spirit Tree is a cidery, bakery, kitchen, and farm store. They pride ourselves on offering the best local products and produce, and on creating superb cider, bread, and pastries for your gastronomic pleasure. We will be getting a tour of the apple orchards and the apple pressing process and this will be followed by a tasting of 3 of their famous award-winning ciders including the "ice" cider. Imagine.... walking around in a spot that eerily resembles the surface of Mars. Exposed red shale rock and rolling hills. 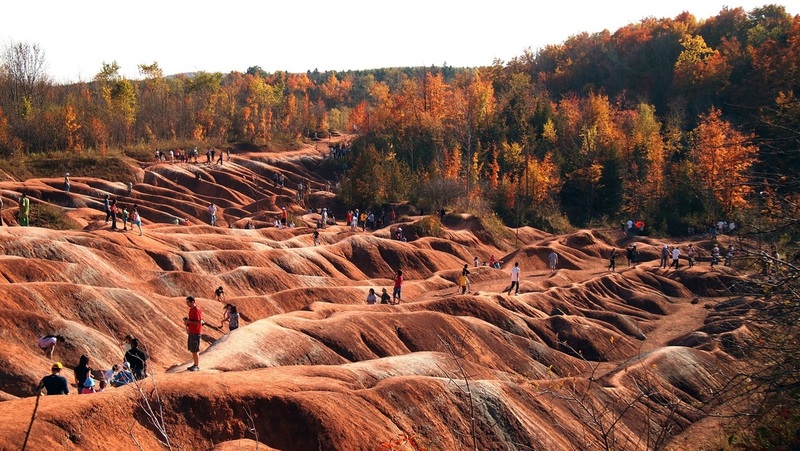 This is the Cheltenham Badlands and this will be our last stop as we explore this unusual geographical feature. The photo opportunities are plentiful and very impressive particularly as we will be stopping here at sunset and the setting sun casts some long and weird shadows among the rolling hills. Please note that this stop is subject to weather conditions. Exploring the badlands in wet weather is not recommended due to safety issues.